August 21, 2018 -- A comprehensive audit conducted over three years at a teaching hospital in southwest England has pinpointed the factors behind a significant improvement in waiting times for reports following MRI in suspected cases of occult femoral neck fracture. Researchers from Derriford Hospital in Plymouth, U.K., audited the inpatient MRI waiting times for 240 patients with suspected occult femoral neck fracture. They successfully identified the reasons for delays and implemented changes to reduce the delays and improve waiting times. Then they completed the audit cycle by assessing the gains made. "Overall, mean waiting time from request to report has improved. This reflects how well the reporting radiologists are performing, being able to partially offset and compensate for the effect of increased waiting time for MRI scans, amidst the ever increasing demand for MRI," noted Dr. Jenn Shiunn Wong, clinical radiology registrar, and colleagues in a scientific poster presentation at the annual congress of the European Society of Musculoskeletal Radiology (ESSR 2018) in Amsterdam. Example of a fracture of the femoral neck that is radiographically occult (a) and (b), but readily demonstrable on (c) T1-weighted and (d) short tau inversion recovery MRI. References: Derriford Hospital - Derriford/U.K. All images courtesy of Dr. Jenn Shiunn Wong. The majority of femoral neck fractures are readily diagnosed on dedicated plain radiographs, but around 3% to 4% of hip fractures can be occult, resulting in a delayed diagnosis that can significantly increase morbidity and mortality, according to according to a literature search by Wong and colleagues (source: Scientific World Journal, 2013;2013:830319. World Journal of Emergency Surgery, 2015, vol. 10:1, pp. 55. Arch Orthop Trauma Surg., July 2010, Vol. 130:7, pp. 915-920). The National Institute for Health and Care Excellence (NICE), an independent public body that provides guidance in England, recommends MRI in cases of suspected occult hip fracture within 24 hours, if dedicated radiographs are negative, they explained. Another example of a fracture of the femoral neck that is radiographically occult (a) and (b), but readily demonstrable on (c) T1-weighted and (d) short tau inversion recovery MRI. References: Derriford Hospital - Derriford/U.K. 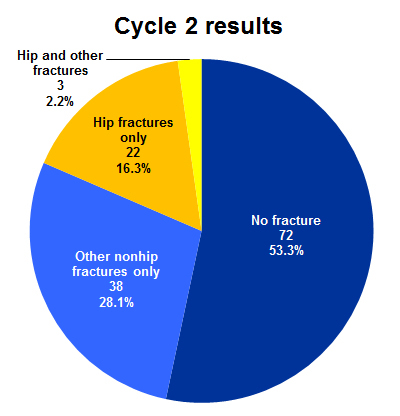 To shed light on the issue, the Derriford team performed a retrospective search on the hospital's computed RIS for all MRI scans that were performed with the clinical indication of querying occult hip fracture. The date range applied for cycle 1 was September 2014 to August 2015, and cycle 2 covered August 2016 to July 2017. They collected data on the date and time of MRI requests, MRI scanning, and MRI report verification. In cycle 1, 105 MRIs fulfilled the search criteria. 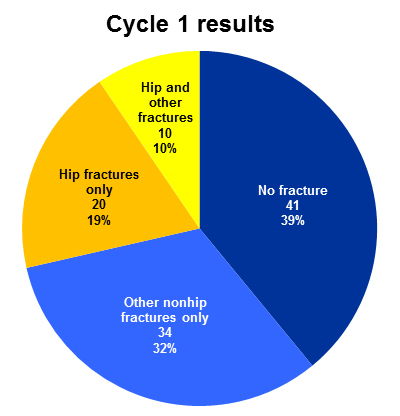 There were 30 femoral neck fractures (28.6%) detected on the 105 MRIs. Breakdown of MRI findings in cycle 1. Source: Dr. J.S. Wong. The percentage of scans waiting for less than 24 hours was 67.6% (n = 71) from request to scan, 51.4% (n = 54) from scan to report, and 29.5% (n = 31) from request to report. The mean waiting times were 32.3 hours from request to scan, 47 hours from scan to report, and 79.2 hours from request to report. No ownership of the MRI scans, therefore leaving them unreported. One of the four musculoskeletal (MSK) radiology consultants in the department had to go on military duties for eight months, while another consultant undertook the clinical director's role. One MSK sonographer was absent on maternity leave, and this meant radiology consultants had to cover her ultrasound/fluoroscopy lists. To improve the situation, a daily MSK consultant rota was introduced to provide inpatient MRI reporting. Also, a standard MRI protocol was implemented for vetting "query occult hip fracture," and the prioritization category of MRI was changed from "routine" to "urgent." In cycle 2, 135 MRIs fulfilled the search criteria. There were 25 femoral neck fractures (18.5%) detected on the 135 MRIs. Breakdown of MRI findings in cycle 2. Source: Dr. J.S. Wong. The percentage of scans waiting for less than 24 hours was 48.9% from request to scan, 82.2% from scan to report, and 27.4% from request to report. The mean waiting times were 35.8 hours from request to scan, 15.6 hours from scan to report, and 51.4 hours from request to report. Shorter waiting times for reports after MRI scans reflect the effectiveness of the daily MSK consultant/senior radiologist rota in providing prompt inpatient MRI reporting, although the improvement may also have been helped by an MSK consultant and MSK sonographer returning to clinical work, Wong and colleagues admitted to ESSR 2018 delegates. The deterioration in the waiting time for MRI scans from request to report was due to the higher clinical demand for MRI, which is outside of the control of reporting radiologists, they concluded. To view the Plymouth group's whole scientific poster from ESSR 2018 on the ESR web site, click here.